It’s March and I finally got in my first race of the year! I’m feeling a little behind, but the ORRC Champoeg 10K was a great start to my 2018 running season. 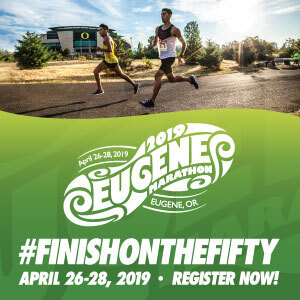 The weather and the location were both great, the atmosphere was just what I needed, and the 10K challenged me. 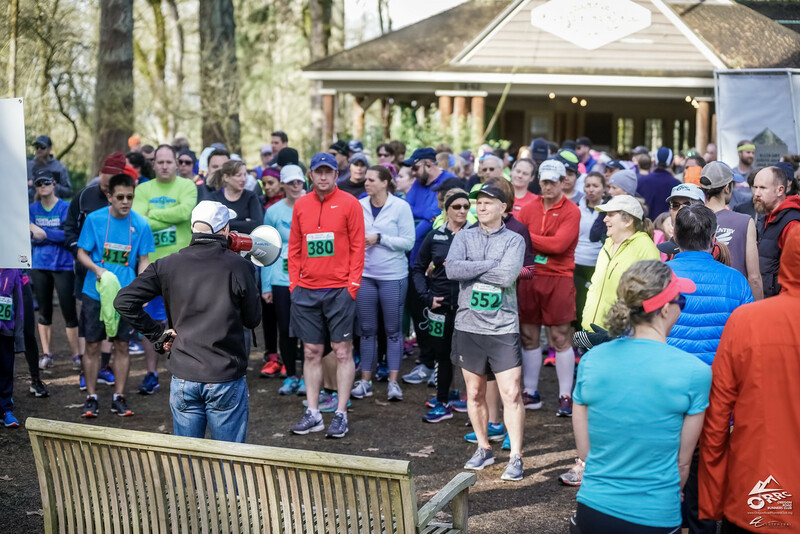 Champoeg 10K runners getting a little pre-race information. After days of cold, wet, windy weather I have to admit I was a little worried about a soggy run. However, Saturday morning was beautiful. Cold, but the sunshine made everything better. When I arrived the 30K runners were deep into their 3 loops and some of them and many of the half marathon runners were already finished. It was fun to see runners spread out along the paths as I drove towards the start/finish area. As I checked in, the group gathered around was a mix of those who had already run and those getting ready to start. It was chilly as we waited in the shade for the 10K to start, but with the late 10:30 start on a sunny morning, I was sure I was going to get warm in no time. I was right. Before I even hit mile 2 I was shedding my long sleeves and was able to run comfortably in short sleeves. Perfect March running weather! 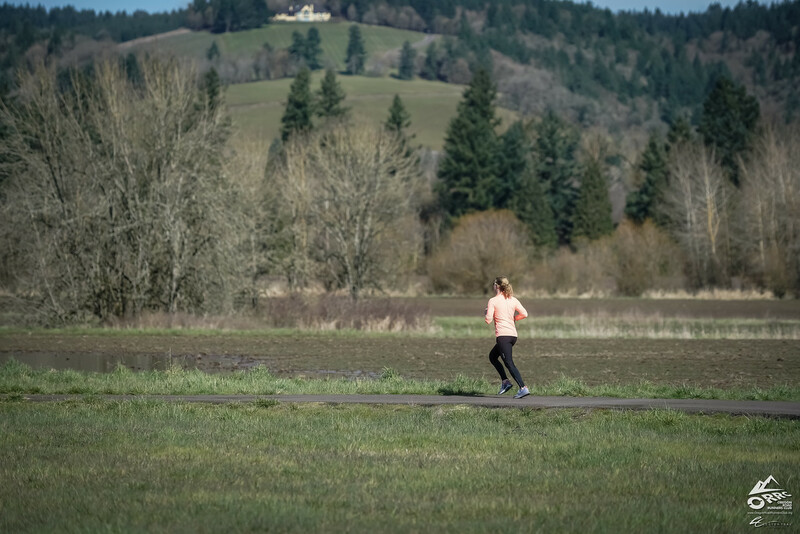 Besides the great weather, the scenery at Champoeg is the best for a run. Forested areas, open fields, the river . . . there’s so much variety. And, while there are a few sections along the road, there is virtually no traffic. I definitely prefer running out in nature over a city run. It has such a relaxing quality to it. In my last mile, as I ran alongside an open, somewhat flooded, field I could hear a chorus of frogs in the distance. Even though I was tired and ready to finish, hearing those frogs helped me get out of my head and just enjoy my surroundings. A runner makes her way closer to the Champoeg Run finish line. If you’ve never run an ORRC (Oregon Road Runners Club) race, I have to tell you, the atmosphere is just different. While well-organized, there is a casual feel to the event. Out on the course the other runners/walkers are encouraging and friendly. With the out and back section of the 10K/30K a lot of people were coming and going past each other. There were lots of smiles and encouraging words exchanged. Running that section reminded me why I enjoy races – and especially ORRC events. It made a challenging section of the run easier and it just made me happy. Yes, the Champoeg 10K has some rollers that make it a bit challenging. It felt harder than I expected it was going to – even though I’ve run this race before. But, as runners, don’t we all appreciate being challenged at times? While I’m not in 10K racing condition, I enjoyed getting in a 10K – even if it was a slow one for me. And, honestly, this race got my mind back in the game. 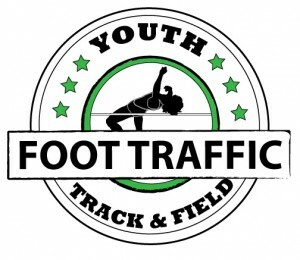 After not feeling like doing a race for a couple of months, I’m now itching to run my next one. Hello 2018 race season! I’m ready for you. 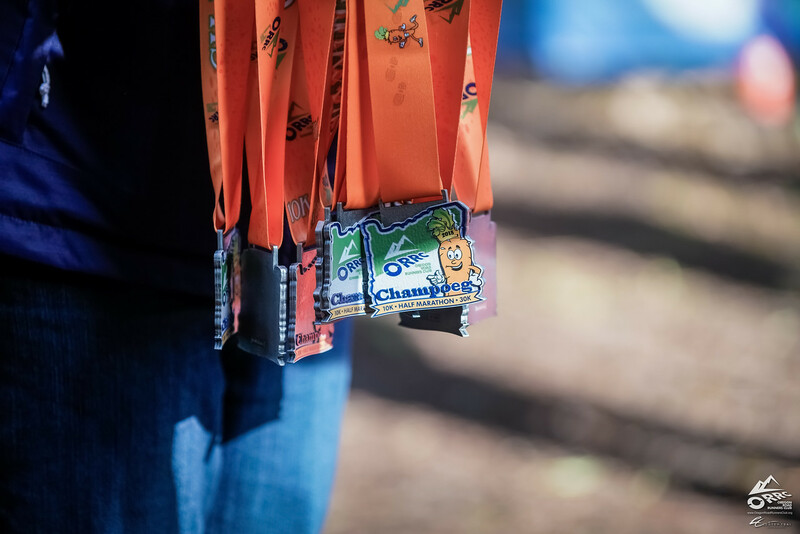 2018 ORRC Champoeg Race finisher medals.